Not since the Sierra Club engaged in bombings of fur coat manufacturers in 1983 has their been such a close link between environmental greeniacs and murderers. This is the world of eco-terrorism. Eco-terrorism is the result of leftist who care more about trees than human beings. Yet even I was not prepared for President Obama to sanction murder in his cabinet all in the name of environmentalism. In what appears to be either a very bad public relations move or a soft on crime weekend furlough program that would make Michael Dukakis proud, Mr. Obama has decided to welcome a cold-blooded killer into our government. Charles Manson is now in charge of a major portion of American environmental policy. The man who once screamed “I’m your mother’s icebox” is now in our government. Yes, America. Charles Manson is in our cabinet. While many people will admit that the third picture is indeed Charles Manson, do-gooder liberals will insist that the first two pictures are of a harmless man named John Holdren. First of all, he is anything but harmless. He is another leftist wack job who wants to create a green world, even if the gains of the evil industrial revolution have to be rolled back. Yet forget his politics. Look at the man. Not since my tour of liberal arts colleges have I seen such sinister looking beards. I know many people think I am suffering the same hallucinations that had me questioning why former New Jersey Governor John Corzine was hiding in my swimming pool. I know I should not have had the FBI round up Amish people and ZZ Top, not to mention some Chabad Rabbis. This is worse. We cannot have Charles Manson setting environmental policy. Not only was he a killer, but even worse, he came about during the 1960s and 1970s. Nobody from that era should be allowed anywhere near power. I never dropped acid or wore leisure suits, nor do I want to be led by somebody who did. Look at Holdren closer. He has one jaundiced eye that is bigger than the other eye. 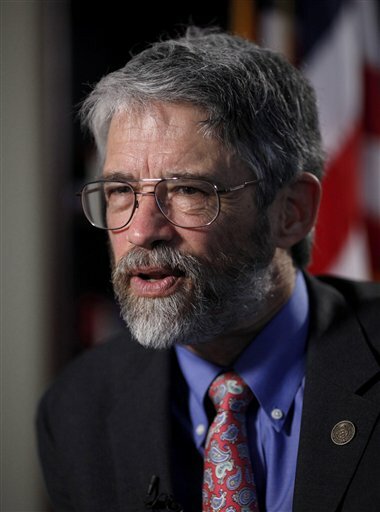 Notice the anti-Republican newspaper Mr. Holdren is reading above. This is critical for two reasons. After three years, I finally figured out how to incorporate “Bill the Cat” into my blog. This has to happen more often. More importantly, Bill the Cat’s famous phrase is how all of America should react to John Holdren. Based on criminal profiles that are not as up to date as other techniques, Mr. Holdren is a psychopathic killer. This is obvious to anyone who has ever studied phrenology. Somebody check to see if the guy has bumps on his head. Do not let this man kill the economy. We must shave his chances of him gaining any political power. The vote will be razor thin. His ambitions must be trimmed. He is scary. He is scraggly. Mr. Obama, I draw the line at Charles Manson joining your cabinet. Do what Bill the Cat failed to do when he ignored Nancy Reagan’s anti-drug campaign of the 1980s. This entry was posted on Wednesday, September 22nd, 2010 at 3:18 am and is filed under POLITICS. You can follow any responses to this entry through the RSS 2.0 feed. You can leave a response, or trackback from your own site. Ah, yes, what could be more evil – more Charles Manson-esque – than trying to make a cleaner, greener world? Amazing. Safer, greener world? I did some simple math calculations. My State of Calif has about 40m people..give or take. We are growing at 2% year, give or take. give or take. Los Angeles County will grow from 10m to 22m. The USA now has 305m people.It is growing at about 1% year. it will have over 750m people. The planet has 6.5b people. It is growing at about 2% a year. be necessary to run the planet and keep the people from starving. Ahmads thugs. But please Obama dont take in 100,000 of them. I dont want to share my pool with people who want me dead.